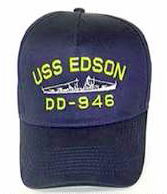 Navy baseball cap with embroidered USS Edson name and ship. Adjustable fit so one size fits most. Tax is included in price. Tax is included in price.